Choosing an Instant Pot can be both exciting and confusing. So many models, so many sizes, so many lovely choices, how do you know which Instant Pot is right for you? Whether you go with the LUX, the DUO or the Ultra, the Mini, the 6 quart or the 8 quart depends on how you plan to cook, and for how many people you cook, and whether or not you like leftovers. 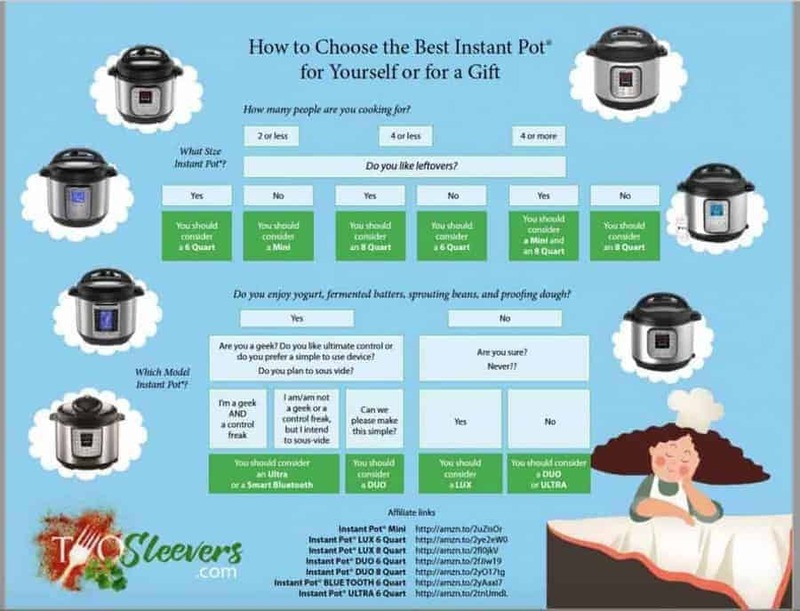 Watch the video below to know which Instant Pot is right for you. Choose amongst the various features and see what will be perfect for your family. I also have a graphic here that you might want to check out. you have to scroll down to where the video is. I keep meaning to change that. As to what fits, basically, anything that is 6 x 2 fits well. 6 x 3 is pushing it. I have the things I use at http://www.amazon.com/shop/twosleever if you want to check those out. Thank you for your info video. I have 2 sisters who love their IP, so I am deciding what model to buy. I’m on a keto diet and I’m in awe of your weight loss. Good for you. I need to lose about 80 pounds too and have lost 20 so far. Thanks! Thank you! I am working off an 8 LB regain right now so I know how hard it can be. Hang in there!